The annual Lancaster Diocesan Pilgrimage to Ladyewell will take place on Saturday 21 June 2014. 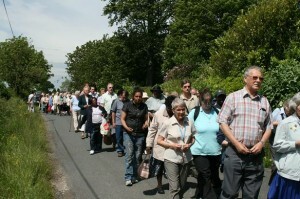 The pilgrimage will be led by Bishop Michael Campbell OSA and commence at St. Mary’s at 2pm. There will be a procession to Ladyewell followed by a homily and Benediction. Refreshments will be served and you are encouraged to bring your church banners to carry in the procession. Please call 01772 700181 for more details and to give advance warning of larger groups.